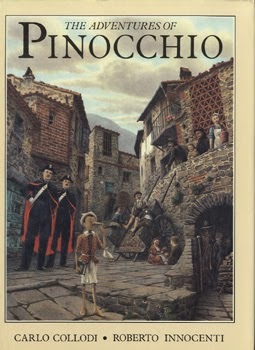 The Adventures of Pinocchio was originally serialized in the two years prior to its publication in 1883, and was written by the Italian children’s writer Carlo Collodi. 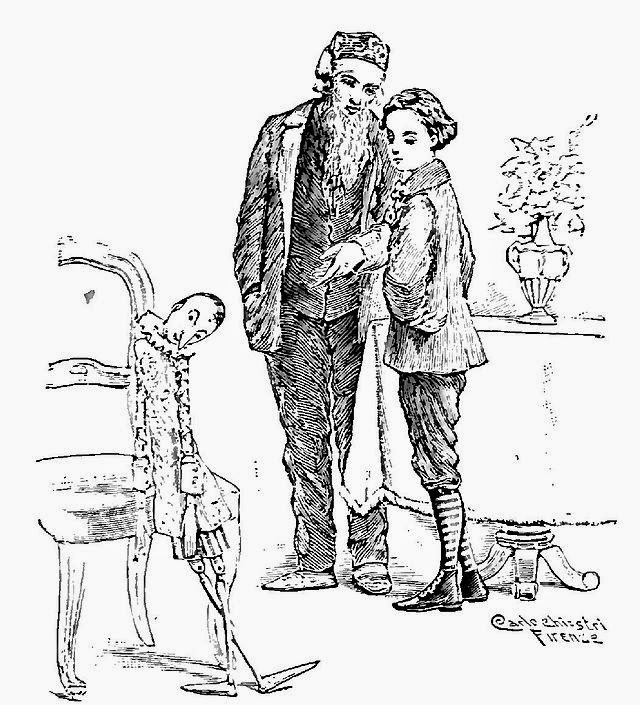 Initially Collodi had Pinocchio die a rather gruesome death at the end of chapter 15 (which is rather reminiscent of Hilaire Belloc’s instructional children’s poetry), but his editor urged another ending, so the reader was finally treated to an extra 21 chapters and a wise addition it was! The book has been translated into 240 languages and remains an icon in children’s literature. Pinocchio begins as a talking block of wood that is given to a woodcarver named Gepetto, who carves him into a puppet and tries to teach him sense, responsibility and moderation. 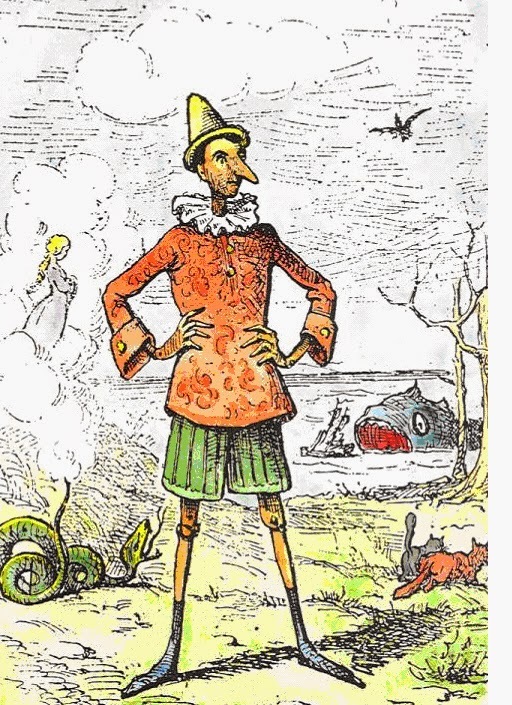 Yet instead of being grateful to his creator, Pinocchio follows his own selfish inclinations and calamitous adventures are the result of his self-indulgent, thoughtless decisions. Eventually Pinocchio learns how dangerous it can be to follow your impulses of the moment, and that responsibility and hard work bring a maturity that is rewarded in a way, that fun and pleasure can never match. Was I imagining it, or were there a number of Biblical allusions in the story? When Pinocchio buried his money, it reminded me of the parable of the talents, where the servant chooses selfishly to bury his money instead of making good use of it. With the large fish swallowing Gepetto, of course, this alluded to Jonah and the whale. And finally, all Pinocchio’s catastrophic adventures that come about by his poor life choices and his eventual change of heart, are on parallel with the story of the prodigal son, who finally returns home to the one who truly loves him and has his best interests at heart. In spite of some of the more bloodthirsty episodes, this was truly a heart-warming story. That sentence sounds odd, I know, but I really appreciated the reality of Collodi’s message. The company we keep has an enormous influence on the character that we will develop, and each of our decisions in life carry an import, sometimes with consequences that are not easily realized. For me, the most shocking part of the story was the episode where the Cat and Fox hung Pinocchio in a tree expecting him to die, but honestly in some bad decisions the outcome could be death, and it’s important to realize that. I’m reading The Plague by Albert Camus as part of a read-along with Bookstooge. As the deaths from the plague mount, the town runs out of coffins and room in the cemetary. Eventually the victims are disposed of in much the same way as the rats early in the story. Yuck! Reality appears to set in on the collective group and the citizens of Oran feel united in their plight. Cottard continues to make money amid the suffering, Rambert decides to stay in Oran, in spite of being given a new plague serum M. Othon’s young son dies in agony, Father Panaloux delivers a fiery sermon and then succumbs to a sickness which does not resemble the plague, Tarrou confesses his history and we find he is in rebellion against societal systems which are “plagues” themselves, and Grand is found wandering the streets ill and somewhat disoriented. He is expected to die but he recovers and soon 4 other patients follow suit. Has the plague finally run its course? 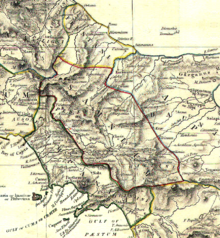 Twelve year old Chloé lives with her companion, Melissa, in a shack in mountains of Samnium outside of Rome. The daughter of a Greek slave and a Roman centurion, at her mother’s death she is abandoned by her father to her fate, which is that of a slave. As Chloé grows to womanhood, she draws from the animals and nature around her as companions. Her character is as lovely as the woods around her, yet still she nurses an abiding hatred for the man who should have loved, nurtured and raised her as his own. When a young Roman nobleman arrives at a neighbouring villa and encounters the young girl, Chloé’s circumstances appear destined to change for the better, yet her past finally catches up with her and Chloe must decide whether she will hold on to the ghosts of the past or reach forward into a new future. 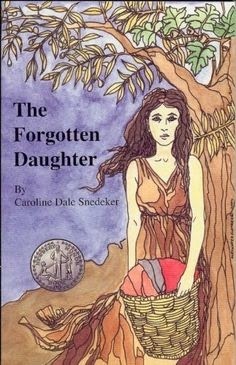 Snedecker was known for her extensive research using only primary or secondary sources, and The Forgotten Daughter sings with a melody of the past. Snedecker’s writing brings Roman life to the reader in vibrant colours and poignant emotions. The descriptions of the setting are beautiful and living, and as a reader you feel that you have stepped right into the story. Chloé’s life as a child slave was perhaps the most troubling and effective portrait that I’ve every read in a book. Snedecker delves into the emotions of the characters in such a visceral way and with an uncanny perception. The theme of slavery was obvious on the surface but also subtly explored through other occurences, weaving fine threads of insight through an already well-constructed story. I absolutely loved this read and will be seeking out other books by Snedecker. 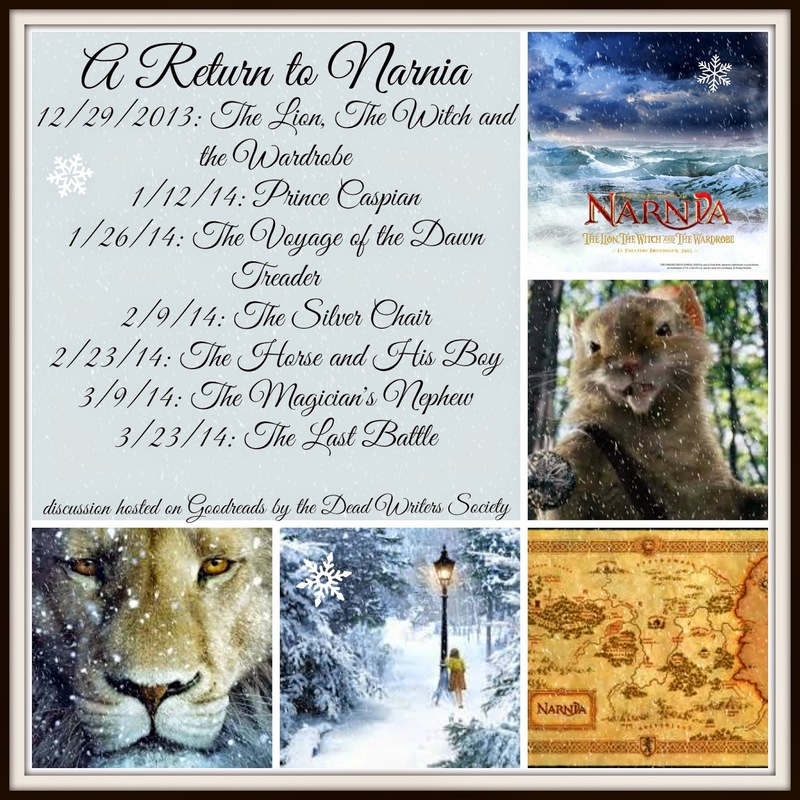 This book was read for Amanda at Simpler Pastimes Children’s Literature Event. 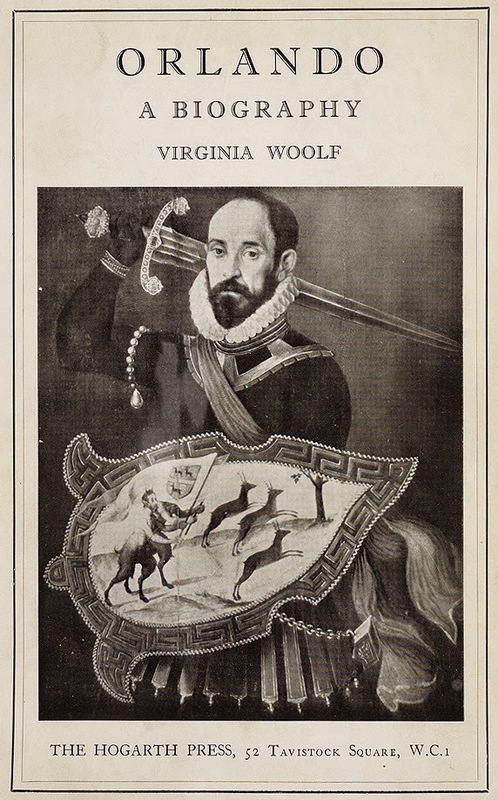 A more extensive review can be found at my children’s blog, Children’s Classic Book Carousel. Camus examines the experiences of different people when faced with disease and death. Some ignore the obvious, some, who are in the throes of love affairs are nearly oblivious to the plague’s effects, some seek pleasures without limits, some profit from the disaster, and some attempt to escape the quarantine. The plague becomes pneumonic and can now be transmitted by air. Not good. A sermon is given by Father Paneloux stating that the plague has been sent from God to punish the citizens for their sins and, oddly, Grand is writing a book and agonizing over the perfection of the first sentence. Rambert, the journalist, is desperate to escape and enlists Cottard for help, as Cottard is now benefiting from the plague through smuggling. We find that Cottard had committed a crime earlier in life and that is what lead to his suicide attempt. With his escape delayed, Rambert finally agrees to join the sanitation committee who keep the town clean, in perhaps a futile effort to stay the pestilence. Read-along hosted by Heidi from Literary Adventures Along the Brandywine who, I must say, is doing an amazing job with her chapter updates! 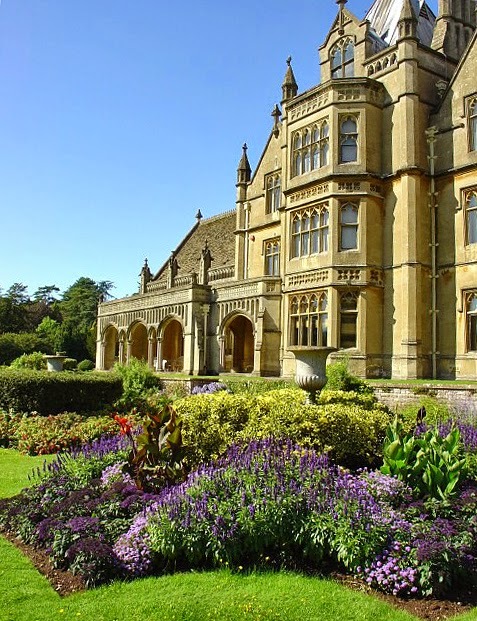 Sir Walter Elliot, widower, and the father of three young ladies, Elizabeth, Anne and Mary Elliot, is the proud owner of Kellynch-Hall in Somersetshire. Due to financial difficulties and, perhaps a too liberal economy, Sir Walter is forced to come to the realization that the family must tighten their purse strings in order to retain their respective position in society and avoid ruin. Through a manipulative type of convincing by Lady Russell, an old family friend, and Mr. Shepherd, his lawyer, Sir Walter abandons his principles and agrees to let Kellynch to Mr. and Mrs. Cole, a mere admiral and his wife. 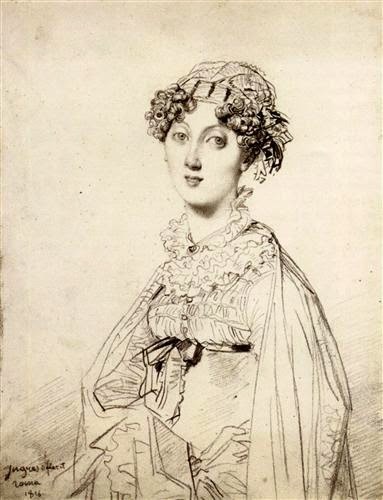 It just so happens that the brother of Mrs. Cole, Captain Wentworth, at one time had had an understanding with Anne and they were set to marry. Yet when both Sir Walter and the respected Lady Russell rejected the match, Anne backed down and the engagement was broken. 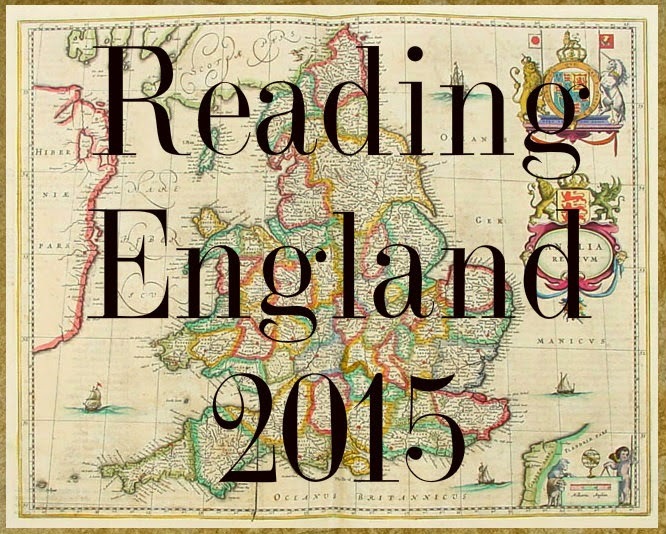 As we reach chapter 6, Sir Walter and Elizabeth have removed to Bath to find a new lodging, Anne is visiting Mary who is ill (it seems perpetually ill), the Coles take possession of Kellynch Hall and there is the impending visit of Captain Wentworth to his sister. I use the word “manipulative” in describing Lady Russell’s and Mr. Shepherd’s behaviour, but honestly, nothing less would work with Sir Walter. His wife had been a model of tact, economy and amiability and her beneficial character traits had tempered Sir Walter’s trying ones, but since her death his vanity and pretentiousness had not only re-emerged, but grown to gigantic proportions. His value is for outward appearances, and inner qualities are completely discounted in his arrogance. He is not a pleasant person. Anne is not yet well-sketched. We sense she is quiet and moderate but she gives us little insight into her private thoughts or emotions. In fact, I find that the other characters act as a foil to hers: Sir Walter’s selfishness and elitism, Elizabeth’s snobbiness and sense of entitlement, Mary’s ill health and complaining, Mr. Shepherd’s manipulation, etc. In comparison, Anne is set in a golden halo of goodness. Sadly I have not quite bought into her character yet. And heavens, it doesn’t help that I had watched the movie years ago, before I’d read the book, and was so disappointed with Amanda Root’s portrayal of Anne. I had hoped that Anne would have some unique qualities that set her apart but, aside from being an extremely good person, I’m still waiting to find that true and special flower among the weeds of her companions. 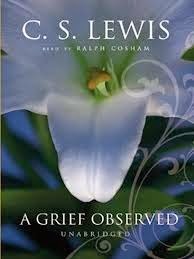 In A Grief Observed Lewis shares his thoughts and emotions with regard to the death of his wife, Joy Davidson, and it is perhaps one of the most powerful books on suffering that I’ve ever read. As a reader, you are drawn into his grief and, contrary to what the title suggests, you can feel and experience Lewis’ anguish right alongside him, at times almost against your will. Lewis is pain personified, and it’s raw and it’s shocking. 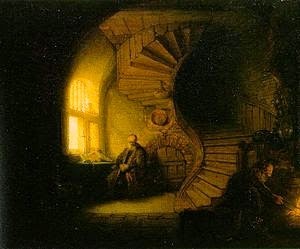 In his book, The Problem of Pain, Lewis deals with suffering from an aspect of reason and pragmatism, but in A Grief Observed, he is a broken man, on one hand calling out for sense and understanding to apply to a situation that is beyond comprehension, and on the other, resisting examining his situation. Lewis’ faith was shaken but not broken. He does not deny God, yet he does ask what kind of God is He? What type of God would allow something like this to happen? He asks hard questions, makes brutally honest statements, and you wonder if this man is on his way to losing his faith. Yet why can’t we ask hard questions of our Maker? Why can’t we storm and rage against the injustices of life? Lewis kicked and stormed against the door of Heaven and instead he found an opening into his own soul. After long endeavouring to remember his wife’s countenance, it is only when he stops struggling to see Joy, that her face suddenly returns to his mind. 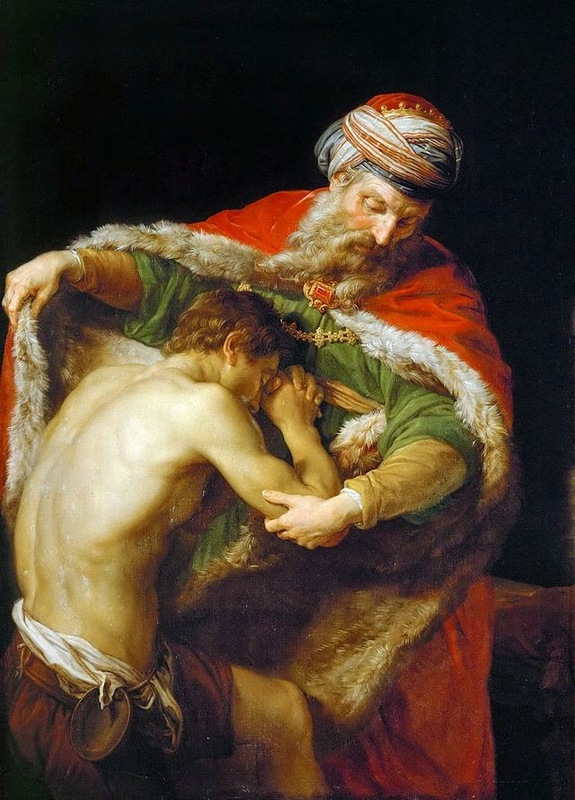 Lewis finally realizes that we need to seek God for Himself — for who He is —- and not for what we can get from Him. Fritz relates the wonderfully poignant story of Ann Hamilton, a young girl who has moved west with her family, which include her parents, and two brothers. Her father, in his wisdom, emphasizes that the family must “look west” now, and that there should be no looking back. Ann, however, finds this resolve difficult. She misses her family, especially her cousin, Margaret, who was her best friend. How will she be able to carve out a new identity for herself in this new unfamiliar land. Who is this new Ann, who is now a pioneer girl? 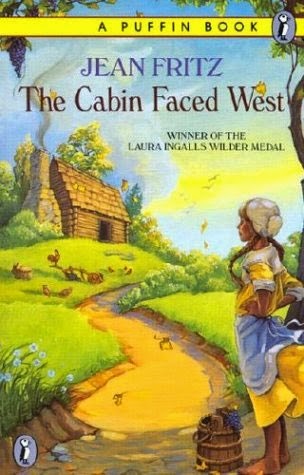 Eventually, through various interactions with her family, other settlers, and George Washington himself, Ann learns the value of this new land and her place within it. Set during the late 1700s, this story is based on a true one which happened to Fritz’s great-great-grandmother, Ann Hamilton. George Washington did indeed stop at the Hamilton’s for dinner on September 18, 1784. His diary reads: “Set out with Doctr. Craik for my Land on Miller’s Run. Crossed the Monongahela at Devore’s Ferry —- bated at one Hamilton’s about 4 miles from it, in Washington County, and lodged at Colo. Cannon’s” And so the story passed down through generations to finally be shared with us all. For a more extensive review, please see my Classical Children’s Carousel! 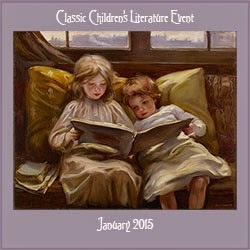 Oh yes, and the first book read for the January Classical Children’s Literature Event! I’m reading The Plague by Albert Camus as part of a read-along with Bookstooge and so far am quite enjoying it! Suddenly in the port town of Oran in Algeria, rats begin to die. Dr. Rieux happens upon the first rat, and from there, their numbers grow. As the population of dead rats increases from a trickle to a flood, people start to sicken with fevers and swollen glands in the neck, armpits and groin. The narrator introduces us to a man called Jean Tarrou, who is vacationing in Oran and claims that his notebooks will give an unusual window into the burgeoning epidemic. 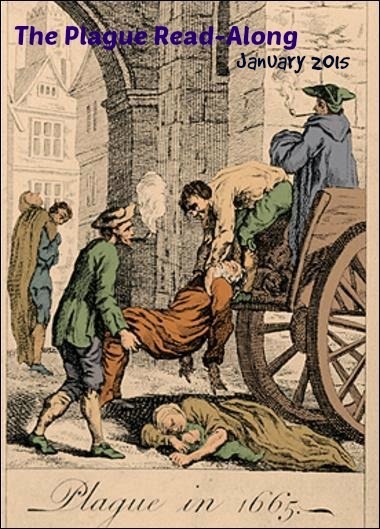 With the corpses beginning to pile up, it becomes more difficult to pretend the disease is anything other than the plague or a type of plague. Dr. Rieux suggests that the information be released to the public, but Dr. Richard still attempts to minimize the crisis, and only signs with sparse information appear in town. More deaths and the state of emergency can no longer be ignored. The town is put into quarantine. Thoughts: The narrator was so careful to set himself up as credible. He’s quick to declare that everything he relates will be able to be corroborated. Tarrou is also described as a person who will give a unique perspective to the plague because he focuses on particulars instead of generalizations …… he’s a peculiar fellow and I wonder if his peculiarities will have some specific bearing on the story. Cottard’s attempted suicide and his change of personality from introverted liberal to a friendly conservative is also puzzling. I quite like Dr. Rieux so far; sensible and intelligent, with little time to suffer fools, he is so far very clear-sighted. 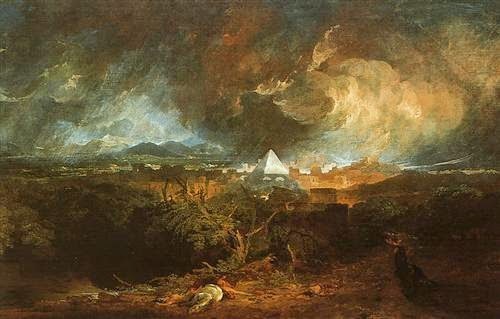 The manner in which Camus links and compares the response to war and plague gives the reader a very believable portrait. So not only do we have a tragedy brewing, we have a little mystery mixed in with a dollop of varying personalities. An interesting recipe to be sure! 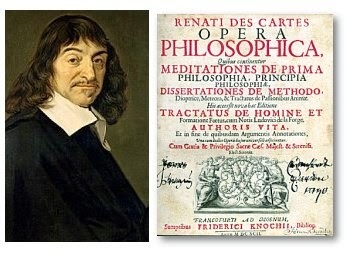 Descartes set out to examine how “everything that can be known about God can be shown by reasons that derive from no other source but our own mind, …. and how God can be known more easily and more certainly than worldly things.” However even as he claims his investigations as “certain and evident,” he is concerned that not everyone has the ability to grasp them. Right then, I knew I was in for a philosophically dense read. 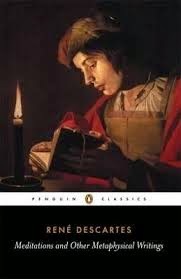 Yet while I trembled, I soon began to realize that Descartes splits his meditations into manageable chunks and, if you employ your brain for short periods, his explanations and arguments can penetrate. I also realized that the title of the book could be of assistance. These thoughts of Descartes were ideas that were probably products of hours and days and years of pondering and questioning and seeking. If it took him that long to produce the ideas, I’d have to be willing to meditate on them if I wanted to develop a basic understanding. And so I went on …. He exists if he is not being deceived. He exists if he is being deceived. He is either being deceived or not being deceived. Interestingly, St. Augustine also argued “fallor ergo sum”, or “I am being deceived, therefore I exist”. I think here Descartes arguments are of a personal and not necessarily a general nature: his mind exists because his thoughts exist. However, he still hasn’t proven that he exists. Descartes starts to lose me here. He examines the dream state and questions how we can know it from reality and then he discusses the all-powerful God which we know and how we could be deceived in our perception of him (I think). Very logically he states that if he is being deceived, that very fact proves his existence. He comes to the conclusion that God is not a deceiver but leaves the door open to accept that there is something that is. I was fascinated by Descartes exploration into ideas. There are ideas which come to us that do not originate with us and, in fact, sometimes impose themselves on us. If they are not products of our will, does that not point to there being something other than us? Whew, that’s certainly something to think about! Yikes, and even deeper we go …….. Descartes concludes that God exists and his existence depends on Him. God cannot deceive because deception involves some sort of imperfection and God is perfect. When Descartes focuses on God he finds no error in himself, but when he focuses on himself, he is full of errors. He calls himself an intermediate being between God and nothingness. With regard to errors, he proposes that two faculties come into play: the faculty of knowledge and the faculty of choosing from his own free will, in other word, intellect and will. 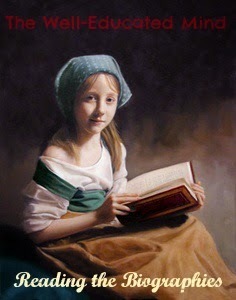 Through his intellect he perceived ideas but through his will he can make judgements. There is a problem though: his intellect is limited —- it cannot perceive all ideas and it does not always perceive clearly and distinctly —– whereas his will is unlimited —- it can make, deny or suspend judgements on anything. 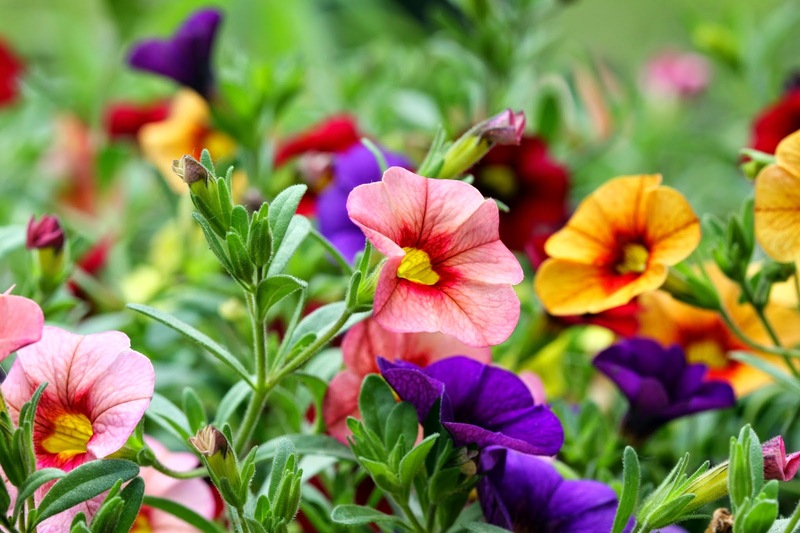 Yet as long as he does not make wrong judgements in his will, he is safe …… if he simply suspends judgement on ideas he’s not certain of, he cannot be wrong. There are three famous arguments about Descartes’ position (one of them being Kant’s argument that existence isn’t a perfection) but none hold up to logical examination, so I guess Descartes is still the winner. As much as it completely strained my brain, the Sixth Mediation really resonated with me. I remember as a small child wondering why I was me. How was it that I felt contained in this particular body and not another? Why was I chosen to be me? How? Why was I a soul living in Canada and not somewhere else? I think this was the start of realizing that I had a soul and was something more than just a mechanical shell or a biological entity. And if that was true, then where did I come from and who made me? Perhaps not original questions, but ones that I think we should think about more in life. Yes, we should all be philosophers! 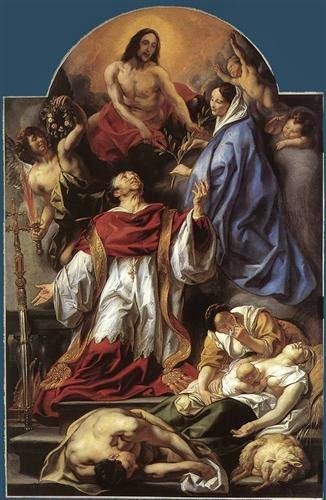 Getting back to the book, it continues with “objections” or responses from Johan de Kater, a Catholic theologian from Holland; Fr. 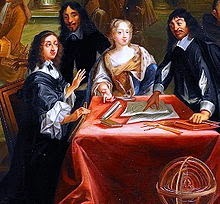 Marin Mersenne; Antoine Arnauld, a Jansenism theologian; Thomas Hobbes; and Pierre Gassendi, a priest, scientist, astronomer and mathematician. I really had to laugh reading some of these objections. In fact, the Catholics were the ones who questioned the logic Descartes used to prove the existence of God. So curious from a modern prospective but it appears that the church was willing to ask tough questions during these times and wasn’t afraid of searching for the truth. So interesting! Descartes’ Replies to the Objections are also very enlightening but so very deep. A course in logic would have been very useful before reading this book, however, I think I’ve covered enough for now. 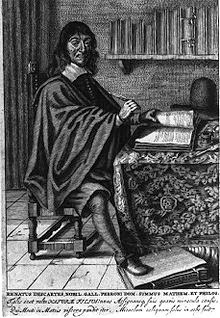 Descartes obviously liked to think and had alot of time to do it. It was mental gymnastics to try to follow him but good for the brain. To really understand it though, you need to have read Aristotlean philosophy along with a number of other more recent philosophies, as Descartes thoughts sprung from that already anchored base. At least my understanding, while minuscule, is more than when I started. Thanks, Descartes!